Because much of what actually happens in the world is random and unpredictable, after years of drinking essentially no mature German Riesling, in the past few weeks I've had maybe 20 mature wines. This is due to the generosity of friends - dinners and things like that. What I'm about to tell you might be old news to you, but WHOA, these wines can be great. 1990 Egon Müller Scharzhofberger Riesling Spätlese. Hard to describe my experience with this wine without gushing over. The wine was shocking, stunning really. Lacy, airy, like gauze. Like the sheer cotton cloth that might have been draped over Ghandi's shoulder against the hot Delhi sun. Seriously though, this wine was ridiculous. Such a delicate touch on the palate, the texture is simply not one I have experienced before. And the aromas, although articulate and clear, were quite a contrast in their intensity and power. We drank this wine with salmon sashimi, among other things, and for me it was a real eye-opener. Before this bottle I had drunk exactly one bottle of Egon Müller's wine in my life. I had no context for this wine, and when I asked about Müller, the first thing my experienced and knowledgeable dining companions told me about Egon Müller is that the estate is the DRC of German Riesling. 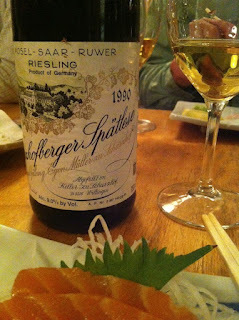 The following week I was lucky enough to attend a dinner featuring a slew of 1997 German Rieslings and I was able to drink two more wines by Egon Müller. I thought they were both truly excellent, again showcasing that startling contrast between lightness and power. 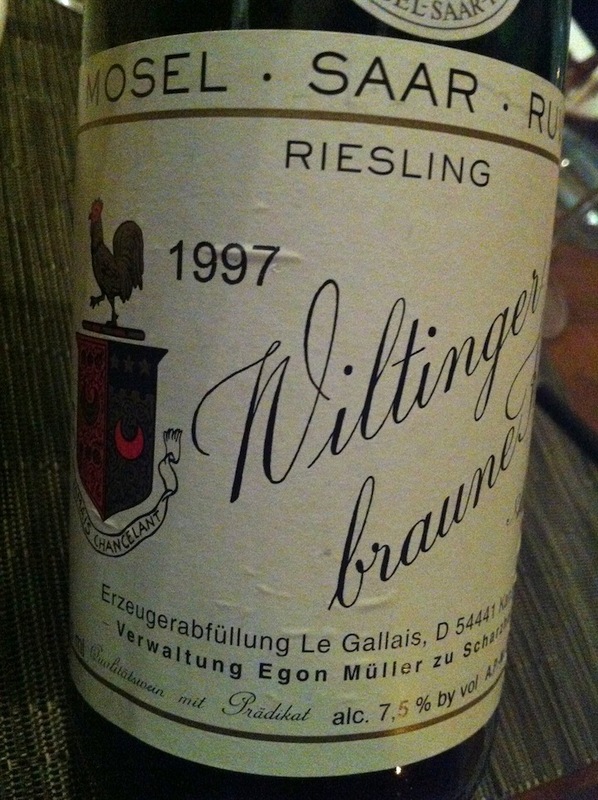 The 1997 Egon Müller Scharzhofberger Riesling Kabinett was a wonderful wine, so graceful, such depth. 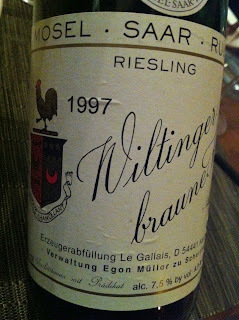 1997 Egon Müller/Le Gallais Wiltinger Braune Kupp Riesling Auslese Auction. So I don't really know what's going on here, but I think Wiltinger Braune Kupp is a different site. And I cannot remember what "Auction" refers to, I'm sorry to say. Perhaps someone will explain in the comments. But whoa, this wine was great. I would love to drink the same mature wine at different pradikat levels one day to try to understand how they compare with one another. I'm sure there is a ton of residual sugar in this wine, but it was so perfectly balanced and focused that even in this ripe vintage, the impression of the wine is not one of sweetness. 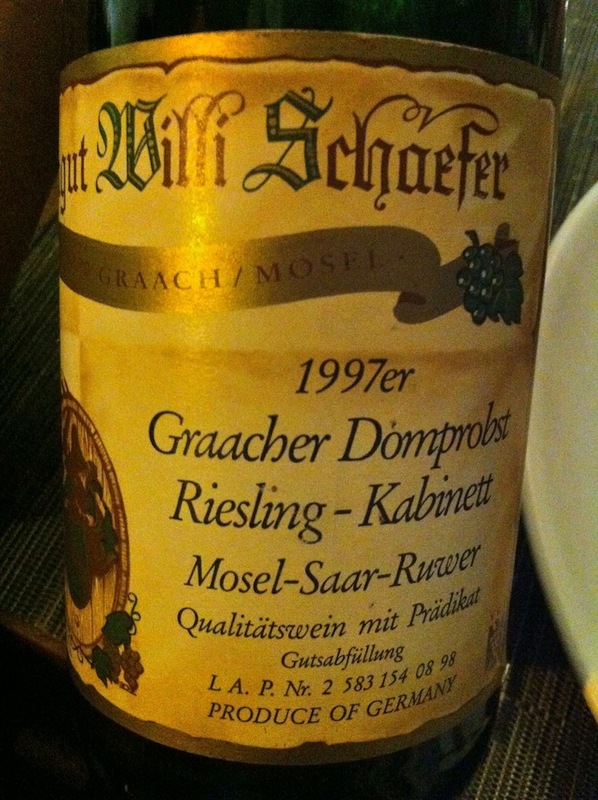 Willi Schaefer has to be one of the finest producers whose wines I can actually afford. In the past month I experienced some mature examples of his wines and whoa, I am very impressed. Several wines form the 2001 vintage and two from the 1997 vintage. All were compellingly delicious. 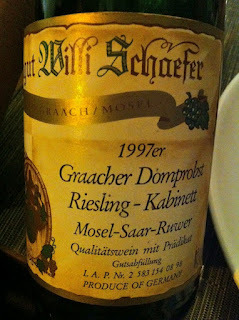 1997 Willi Schaefer Graacher Domprobst Riesling Kabinett. Seriously? The new vintage sells for under $25. This wine had to cost less than that. And now, 15 years later, it's really this good? Clearly on the same level of quality, in my rather thin and uninformed book, as the Egon Müller wines. I loved the grace and delicacy of this wine, and its tingly acidity and overall vividness. And since I'm kvelling about German wines, I have to tell you about the most exciting red wine I've had in some time. 2009 Enderle & Moll Pinot Noir Muschelkalk, $55, Imported by Mosel Wine Merchant. Dan Melia gave this to me as a present before he left town. I assumed it was the entry level Pinot. I was wrong - it is made from a .6 hectare plot of 60+ year old vines and it is a rare and special thing. If you can read German, the Enderle & Moll website might be helpful. I drank the wine over three days and it was delicious immediately, showing vivid wild cherry flavors and excellent balance. But it was days two and three when the wine showed all of itself. The fruit is still vivid but more complex now, and the mineral expression on the finish became an integral aspect of the wine, with iron and dark smokey earthy notes. 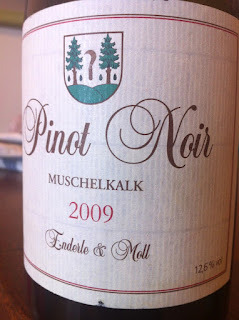 The wine really is wonderfully balanced and graceful, and it offers all of the pleasures of great Pinot Noir. In fact, in my humble opinion, this wine at $55 offers as much or more than almost anything I can think of at that price point in Burgundy red wine. This is one to buy, if you can find it. It's taken me a long time to write this post. On the occasions when I get to do something spectacular in the wine world, I usually write something rather quickly. Not this time, and it's because I don't have the typical unabashed praise for the wines and for the dinner. This was indeed a spectacular event, and still, I have some criticisms. It's been hard to figure out how to write about them without making blanket judgements that I do not actually have the depth of knowledge to support. So I will say this: I want to tell you about the amazing Jacky Truchot dinner I attended recently - the good parts and the bad parts. And please remember while reading this that my criticisms (and my praises) are just my own opinions, nothing more. 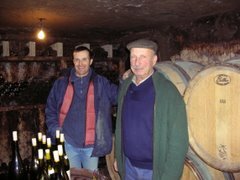 Jacky Truchot made wine from plots in Gevrey-Chambertin, Morey-St.-Denis, and Chambolle-Musigny from the late '70s through the 2005 vintage. His wines have always had a very high reputation among Burgundy cognescenti, and you might think of them as "insider's" wines. He retired after the 2005 vintage and sold almost all of his vineyards. Since then Truchot's wines have skyrocketed in price. Good Burgundy is never cheap, but a 2002 Truchot villages wine that would have cost about $45 on release now fetches something like $150 at auction. The top wines...I saw $250 as the starting point in a recent auction. Why so much money now? As with the wines of Noël Verset of Cornas, for example, every time a bottle is opened, there is one fewer left on the planet, and no more will ever be made. And perhaps Truchot isn't as much of an insider's wine anymore. It's hard to track exactly how word gets out in these cases, but all of the sudden collectors who hadn't been buying Truchot are buying it in force. And the prices have risen as a result. When I asked friends who are far more knowledgeable about Truchot than I am, two main themes emerged. Purity - I heard that several times, from everyone I asked. The wines are supposed to be brilliantly pure in their expression of terroir. And traditional - farming and wine making are both done in the traditional style. In this case traditional means good farming, old vines, high yields, minimal intervention, no fining or filtering.Yup - high yields. No thin yield, super-powerful wines from Truchot. These are described as feminine wines of grace and finesse. Before I share thoughts on the wines, I want to share a few criticisms about the food - the pairings specifically. We ate at Union Square Cafe, the classic NYC restaurant. The food was delicious and I enjoyed everything I ate. But with flight 1 we were served Vanilla Scented Poached Lobster with Sweet Pea Salad. An excellent dish, beautifully prepared and presented. But with those three wines? I was open-minded, honestly I was. It just didn't work, to my taste, and I wound up drinking Champagne with this dish. The biggest food problem, however, was the final course served with Flight 4. Mature red Burgundy is a gentle thing and the complexity of its aromas can be overwhelmed by strong tastes or smells. With these grand old wines we were served a plate of delicious and well-selected cheeses. Including the wonderfully grassy, pungent, and stinky Hudson Red, from upstate NY. I couldn't smell the wine, and I was not able to discern much detail of flavor either. Perhaps I am too sensitive and precious of a Brooklynguy, but all I could smell was cheese. And it hung like a cloud, it never left. And I might as well complain about the wines a little, while I'm complaining. We drank wines mostly from the 2002, 2003, and 2004 vintages. One could argue that with 2005, these might be the very worst vintages for current drinking in that they are no longer young, but they are not mature either. They are likely to be shut down, or at least tight and constricted. This makes it hard to appreciate whatever glory is within, and when dealing with something as rare and pricey as Truchot, that seems like a shame. Whatever. I certainly didn't protest as I drank these wines. I'm just sayin', that's all. The real issue I had, the disturbing realization for me, is that the wines are probably not worth the money they now cost or the iconic status they now have. 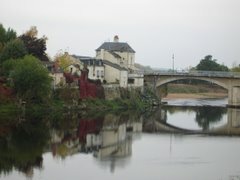 It is possible to expect too much from wine, especially when retirement or some other finality makes the wines scarce. Truchot devotees are now readying themselves to type out indignant ripostes in the comments. Do as you must, devotees. All I mean to say is that the wines are very good, and made in a lovely style. But are they among the greatest red Burgundies? 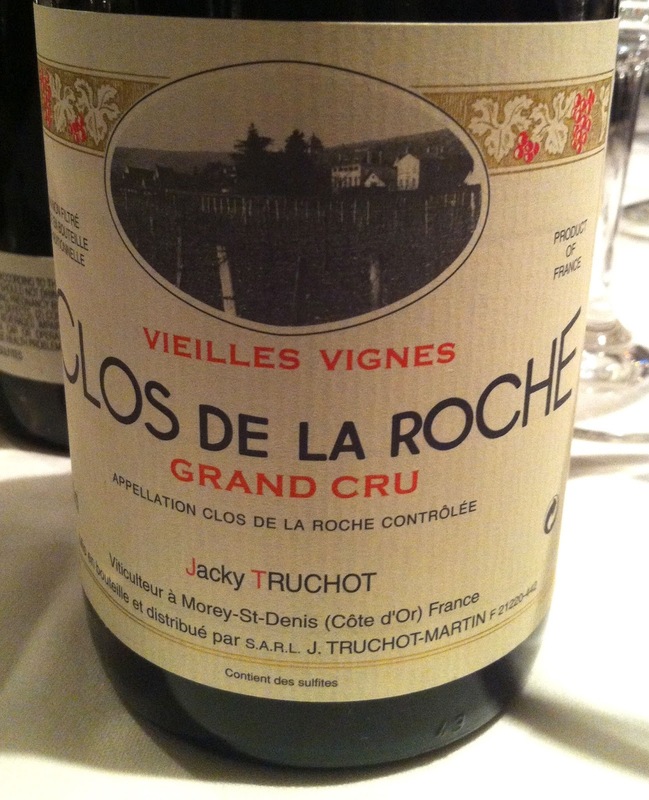 Is Truchot's top wine, Clos de la Roche, the finest example of wine from this vineyard? 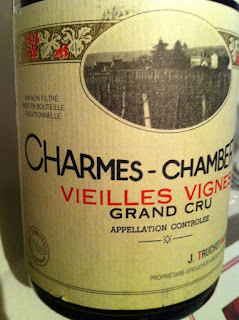 Is the Charmes-Chambertin the finest of its type? Many people would say no in both cases, and yet the wines are now being traded at prices to rival Bachelet's Charmes-Chambertin and not quite yet Dujac's Clos de la Roche, but getting closer. This probably says more about the way high end Burgundy is bought and sold than it does about the actual opinions of the most knowledgeable Burgundy lovers, but it is still a shame. Okay, now about these wines. I was impressed with how clearly they reflected vintage character, and by the clarity with which they conveyed aroma and flavor. And yes - by their faithful expression of terroir. And by how good they smelled and tasted. The 2004's seemed to transcend the problems of the vintage. They were more generous and ready-to-drink on this evening than the others, and I thought they all showed lovely floral perfume (not even a slight trace of 2004 "green-ness"). Not as substantial as the other vintages, but still quite lovely. The 2003's also were better than I expected, except for the Chambolle Sentiers - I found this bottle to be hollow and uninspiring. They were ripe, but not in any way ponderous or overdone. Some complained that they lacked mid-palate depth. Most folks agreed (and they are all more experienced than I) that the 2002's were the best wines and that they would be quite grand at maturity. I must say that I did not understand the 2002's, that I simply am not experienced enough to be able to interpret them in their current state of tightness. For example, I found the 2002 Clos Sorbes to show fruit aromas that were too heavy, verging on overripe. 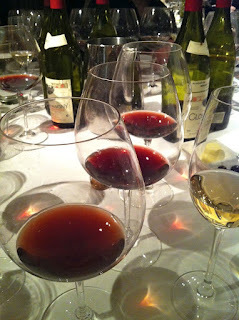 The 1999 Morey-St-Denis was in a great place for drinking, with complex musky aromas that still echoed ripe red fruit. A great example of why it can be so rewarding to hold onto a simple villages wine for 12 years. After the first flight came a trio of wines from Clos de la Roche. This might seem obvious to you, but it was fascinating to experience this for myself: Clos de la Roche is one of the greatest terroirs of Burgundy. It simply outclassed the other wines, including the Charmes-Chambertins, with layers of complexity and an articulate depth that the other wines did not achieve. 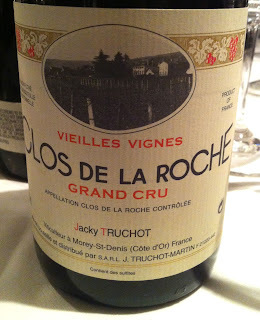 My first sip in flight 2 was 2004 Clos de la Roche and it was truly startling. 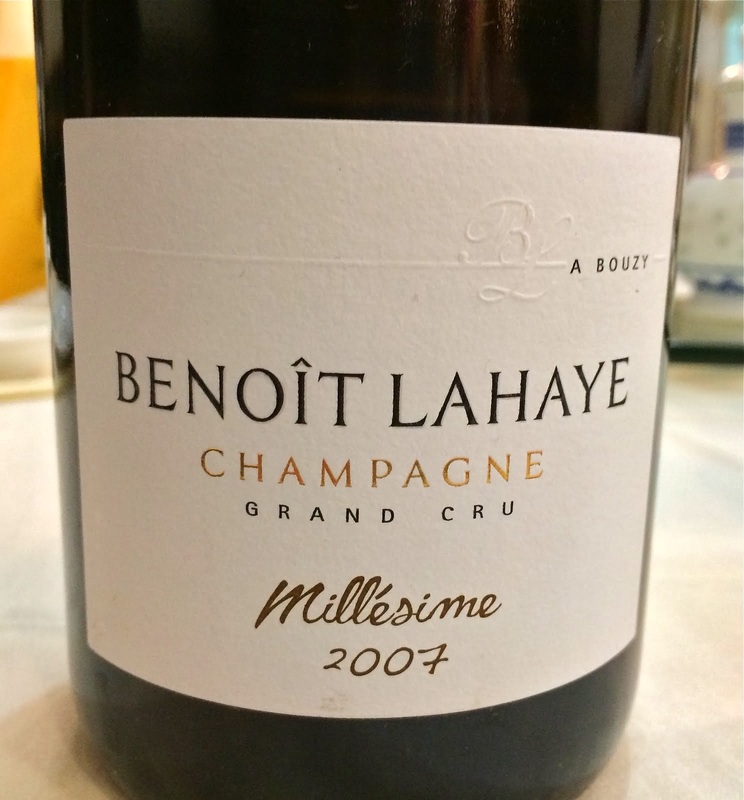 The 2002 was very constricted, but others thought it was stunning. 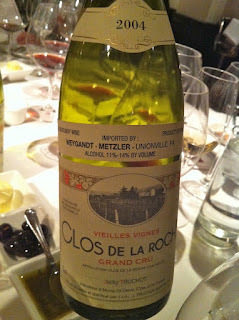 Even where I found the fruit to be a bit heavy, the minerality was immutable. The fight of Charmes-Chambertin wines suffered a bit after the Clos de la Roche flight, I thought. The 4th flight promised to be exciting, but the 1990 was off, re-fermenting possibly, as the wine was effervescent and tingly on the tongue. And I have nothing detailed to say about the 1989 or the 1999 (the cheese problem), but they both seemed lovely and very well balanced. It feels kind of funny to be criticizing aspects of an evening such as this one. I did enjoy people's company, I certainly learned a lot, and I do not take for granted the opportunity to drink these wines. I recognize also what goes into an evening like this. Someone had to know enough to buy these wines in the late '80s and in the '90s. They were patient with them and stored them properly. They worked to get a group of pleasant people together who can contribute bottles, and to arrange a fine dinner at a fine restaurant. This evening was successful in most of those things, and I was lucky to be along for the ride. Not long ago I was at one of those dinners with maybe 10 people at the table and everyone brings at least two very good bottles of wine, and when it was all said and done I felt like I didn't really get to spend enough time with any of the wines. 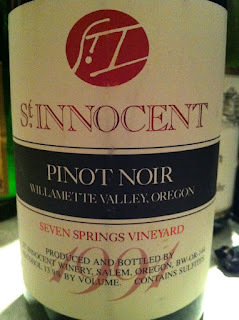 One of the wines was a real surprise, the 1991 St. Innocent Pinot Noir Seven Springs Vineyard. It's not the quality of the wine that surprised me - I honestly cannot comment on the quality because I spent maybe 5 minutes with it while consuming a soup dumpling and chatting with my neighbor. And then I moved onto my two ounces of whatever the next amazing wine was. Not being critical - this is the way it goes sometimes. These dinners happen and it's great fun to be there. I'm just recognizing the fact that wines can get lost in these settings. And I was surprised to see St. Innocent, that's all. It was like running into an old friend, some one who I hadn't seen in a long time and had no expectation of ever seeing again. I used to drink a lot of Oregon Pinot Noir. Not anymore, there are just too many other wines that I prefer. Seeing this wine though, it got me thinking about how I've changed since my days of Oregon Pinot. 1) I drink way more white wine than red. My Cellartracker notes in 2011 show that 62% of the wines I drank from my cellar were white wines. So far in 2012 it's 70% white wine. The thing is, I want white wine with everything, even red meat (is brown Sherry really a white wine though?). Red wine is almost never as light as I want it to be. When I drink red now, I want it to be mature and gentle. 2) I'm much pickier as a buyer. I have a better sense of what it is I want to drink, and I drink mostly those things. I almost never spend money trying new Burgundy, or new Loire Chenin Blanc, or new anything. Too expensive. I have opportunities here and there to taste things that are new to me, and friends whose recommendations I trust. 3) Restaurants...I'm much more skeptical about ordering wine at restaurants. Even some great restaurants store their wine in boxes in the basement. No temperature control. Bad glassware. Servers who pour glasses almost to the top so they can sell me another bottle quickly. Some restaurants have good wine programs and good wine service, and I order wine in those cases. More often though, I drink beer or cocktails at restaurants. 4) Natural, organic, and biodynamic...these are not the things that drive my decisions about what to drink. Not that they ever were, per say, but I used to be a lot more concerned with those things. I still believe in eating and drinking in a healthy way, and like to support producers who are respectful of the environment. But some of my favorite wines would not fit in those categories. So be it. 5) No more industry tastings. They're not really about the wine anyway - they are professional networking events, and they are probably quite valuable in that way to wine professionals. I am not a wine professional, and I can't deal with the atmosphere at those things. I need a compelling reason at this point if I'm going to go. At some point during the dinner a friend pulled out a wine that surely could be the focal point of any wine evening, the 1976 J.J. Prüm Riesling Wehlener Sonnenuhr Auslese. A 35 year old wine from one of the great masters in Germany. 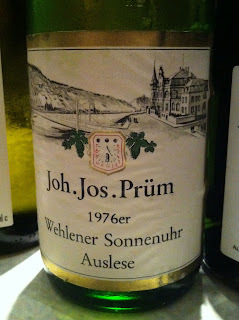 It was by far the oldest bottle of Prüm that I've had, and it was in great condition. I really tried - I paid a lot of attention and focused as best I could, and I think I got a sense of the wine. But I'd love to be with it for a few hours. It got me thinking about how after almost 5 years of writing this blog, I'm still the same. 1) I still have never had many of the great wines of the world. And when I have, very few mature bottles. Great old wine is expensive, and I think that many of us who started getting serious after the '90s will need an awful lot of money if we are going to experience the great ones. I mean seriously, a bottle of Rousseau Chambertin from a decent vintage costs $1,000 now. Hard to imagine being able to afford that. I've never tasted Rousseau Chambertin. It is entirely likely that I never will. 2) But I still don't claim to have had those wines, and I still have no dogma whatsoever about what I like and don't like. I have my opinions, and now a little tiny bit more experience to back them up, that's it. 3) I'm still driven by curiosity and the desire to learn, I still ask a lot of questions, I still try to listen very carefully, and I still understand every day how much there is that I don't know. And I still rely heavily on a couple of world-class wine gurus, who continue to patiently and generously share their knowledge. 4) I still care more about who I am drinking with than I do about how rare or awesome the wine is. Even is a wine is great - if we aren't sharing the experience together in a meaningful way, it's like a tree falling in the woods with no one there to hear it. 5) I still want to be thrilled by wine, to find something that makes me want to delve deeply into the whole region from where it came, to understand all of its iterations and categories. And then sometimes write blog posts about what I learn, for no reason other than that it makes me happy. I remember a long, long time ago eating lunch at a friend's house in Connecticut. His grandmother lived most of her life in Italy and she spoke almost no English. She made our lunch and I do not remember most of what we ate, but I remember the very first thing we ate. It was a salad of dandelion leaves, nothing else, and it had this incredibly bitter dressing. Dandelion leaves are already bitter. I was worried. But somehow it worked, this elevation of bitter. In my understanding, this is a common thing in Italy, bitter greens with bitter dressing. There is chicory at Bill Maxwell's stand at the farmer's market these days. Chicory is a bitter green. It's good for you, you should try it. There are many delicious ways to enjoy chicory, but the other day for lunch I was craving a salad that showcased the bitterness of the green. So I took two shiny white cloves from a green garlic bulb and along with two chunky anchovy fillets, mashed them to a paste with a mortar and pestle. I added a pinch of salt. Then added a couple of glugs of good olive oil and whisked. I put just a dab behind each of my ears. The dressing never really integrated - there was no egg yolk, no mustard, not even any vinegar. But it didn't matter - it was pungent and bitter and umami and delicious. A few spoons of the dressing tossed with the greens, a quartered lightly boiled and hand-peeled egg, and a few strips of red pepper to remind me that there is, in fact, sweetness in the world. This is a healthy and satisfying salad, albeit one that should be followed by a piece of very high quality mint flavoured chewing gum. 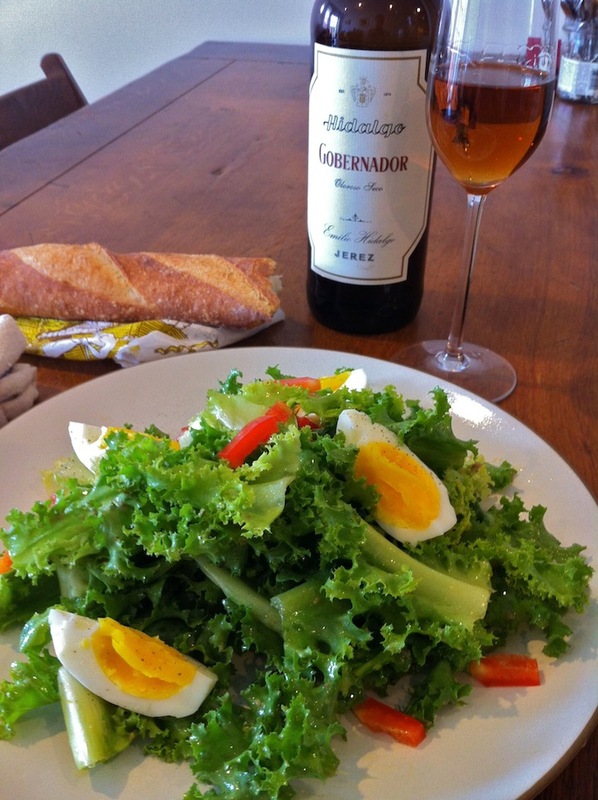 What to drink with this salad and its bitter flavors? I wanted something that feels fresh and bright, and maybe with a sweet note. But not sweetness of fruit. Not sugar at all, actually, but something that has sweet aromas. And definitely but not something terribly acidic or piercing. Something that might complement the bitter, or at least not fight with the bitter. Emilio Hidalgo Oloroso Gobernador Sherry, $23, imported by Winebow. It made perfect sense. I must admit that Oloroso is the dry Sherry category in which I have found the fewest wines to love, so far. But I am a big fan of Gobernador (and of essentially everything made by Emilio Hidalgo). The wine is richly complex on the nose, and also very elegant, a wine of finesse on the palate. It has a brightness in tone that I appreciate in a wine that also shows the richness of roast nuts and dried fruit peels. With a little bit of air, there is a lemony, almost sweetness to the aromas. And this is not an acidic wine, it is mellow. Sometimes you get it right. This was one of those times. The salad and the wine were both delicious and the pairing elevated them both. And let this be a lesson to the both of us - Sherry pairs well with everything. It will come as no surprise to you that there is no Aunt Jemima, Mrs. Butterworth, or any other corn syrup laden imitation maple sryup in my house. I mean really - you don't have to have awesome sunglasses, ironic facial hair, nor do you you have to spend $239 on a ticket to The Great GoogaMooga to know that real maple syrup is just so much better. 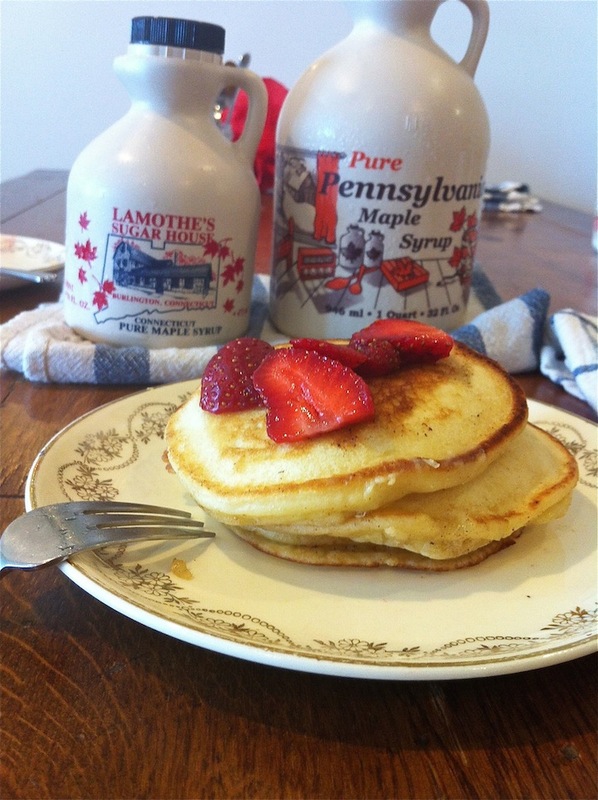 1) Maple syrup aromas and flavors can differ from place to place and from season to season. 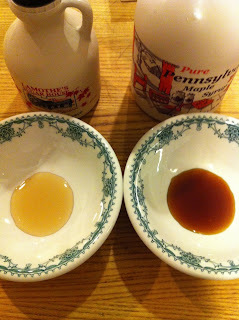 Hmmm, so not all maple syrup should smell and taste the same. 2) Maple syrup must legally be at least 66% sugar when it's bottled. But maple sap as it flows from the tree has nowhere near that concentration. At the beginning of the season when the sugar runs high in the tree it can be between 4-5% sugar (or Brix, if you will). Towards the end of the season it can be less than 2% sugar. That may not seem like much of a difference, but it is. The sap is boiled in order to achieve a 66% sugar concentration, and sap at 4-5% brix requires a lot less boiling time. The boiling process imparts its own aromas and flavors to the finished syrup. The dark brown maple syrup that I've been buying - that lovely dark color and the intensity of the aromas and flavors comes in part from the process by which the syrup is made. I've been buying Amber maple syrup, syrup made from late-season sap that began with a lower sugar content. In this sugar house in Connecticut I tasted Golden syrup for the first time, syrup made from early season sap that began with higher sugar content, and required less time in the boiler. It was nowhere near as intense as Amber syrup, but it had a purity that was quite compelling. 3) Maple syrup is filtered before bottling in order to remove "sugar sands" and other particles. Thank goodness, too. Customers don't want to buy syrup that might throw a sediment, or appear anything other than crystal-clear. 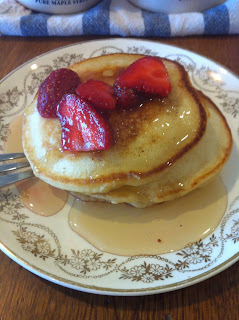 They might feel as though a cloudy syrup, or one that has crystals at the bottom of the bottle, is a lesser syrup. Better to filter it heavily, to remove those particles. It's funny how obvious this all seems to me now, yet I never thought about it. And I am someone who cares about what I eat and drink. Not to say that there is anything wrong with eating dark amber maple syrup - of course there isn't. Golden syrup is more pure in maple aroma and flavor though, if that matters to you.